Low Fell is the highest in the ground of fells north of Loweswater, and the summit is a splendid viewpoint for Loweswater lake, the Vale of Lorton and the Buttermere fells (with a full length view of Crummock Water), with no intervening high ground in those directions. To the north it merges into the undulating plateau of the Loweswater fells, a grassy area crossed by annoyingly well maintained fences (thankfully well provided with stiles). One field boundary even crosses the gap between the two summits, although thankfully without providing any real obstacle. The northern Loweswater Fells form a rough rectangle of high ground, stretching north from Loweswater up to Fellbarrow. Low Fell sits at the south-eastern corner of this rectangle of high ground. It takes the form of a ridge that runs south from Sourfoot Fell and Watching Crag, with the Vale of Lorton to the east and the minor valley of Crabtree Beck to the west, ending with a craggy south face that forms part of the steep northern wall to the Loweswater valley. The southern and eastern flanks of the fell are too steep for walkers. 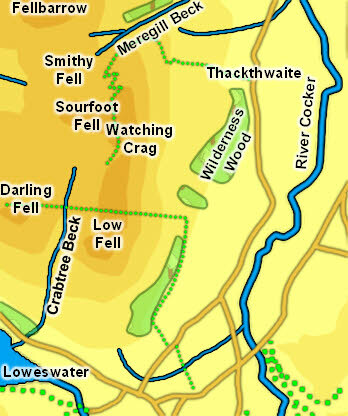 Low Fell can be reached from the north - use the track that runs up from Thackthwaite if coming from Lorton, or make your own way across the rolling hills if coming from the west or north. From Loweswater it can be reached over Darling Fell, starting from the old Mosser Road, or by coming up the valley of Crabtree Beck to meet the path that links Darling Fell and Low Fell. Low Fell has two summits. The northern summit is the highest point in a long ridge that runs north-south and is the higher of the two, but the slightly lower southern summit is far more interesting, with some rocks emerging from the grass and fantastic views of Loweswater and south towards the Buttermere Fells. The northern summit is the highest point in the northern Loweswater fells, but the southern summit is slightly lower than Fellbarrow. The western boundary of the fell is formed by Crabtree Beck, which runs between Low Fell and Darling Fell. To the north-east Watching Gill runs down the steep eastern slope of the Loweswater Fells, starting in the dip between Watching Crag and Low Fell. The River Cocker forms the eastern boundary of the fell. The southern boundary is formed by the stream that links Loweswater to Crummock Water - this starts as Dub Beck and becomes Park Beck below Loweswater village. Low Fell has no tarns, but it does had short footholds on the north-eastern corner of Loweswater and the north-western corner of Crummock Water. There was once a reservoir in the valley of Crabtree Beck, probably in the upper section. The route of an old watercourse can still be traced, but the dam has disappeared. In 1828 the dam broke and in the resulting flood two inhabitants of Crabtree Farm were swept out into Loweswater and drowned.